OSWEGO, NY – With support from the Kingsford Park Home and School Association the Oswego elementary school hosted a Book Camp for all students, pre-kindergarten to sixth grade. The Book Camp is to quickly get students back into the habit of reading “good-fit” books on a daily basis. Students read to younger school mates. 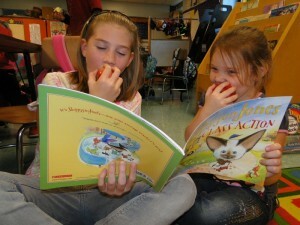 Ashley Patterson and Brooke Samson shared a book as well as sweet, juicy apples. Students received a new book compliments of the home and school organization.